As a young boy I discovered I had a natural talent for construction. My father had hired a contractor to build a deck, but I told him he didn’t need a contractor. We could do it. I was always inquisitive and liked to help out neighbors. I always asked, “Why?” and looked for ways to get things done. My father’s deck was a why. Why couldn’t we just build it? I did the calculations for how much wood we needed to get the job done. After the deck was finished, we only had two boards left over. At that time I had a paper routes and got to know the neighbors along my route. Two of our neighbors were thinking about having additions built on their homes. After they told me what they had planned, I told them to supply the labor and I would tell them what they needed for the job…I was only twelve years old. Before I went to college one of those neighbors hired me to work at his mechanical contracting company. After college I began a career working in “corporate America” that involved traveling throughout the country and internationally. I began thinking more and more of the day I would be able to follow my own dream. I was ready to settle down with my family to start the construction company I had dreamed about since I was twelve. Early on in my career I worked on a job site that was different from most. The house had been under construction for four years. Minds and plans kept changing and the site went from being a small project to the general contractor having to build the house from the inside out all over again. Because things kept changing there were a lot of people just standing around for long periods of time. I spent that time soaking in what worked and what didn’t. Construction has been a part of my life for so long now that I have an ‘organic’ knowledge about it. When it comes to the almost unlimited amount of options and possibilities when building or remodeling a home, I know what works and what won’t. Now Lake Norman is home. I have lived and worked around the lake since 1998 and I can’t imagine doing anything else. 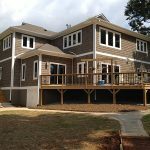 I am pleased that you landed on this page and wanted to find out more about my story and how I approach building and remodeling. I look forward to the opportunity to speak with you in person to learn about your dreams and to show you how they can become a reality. Please call (704) 363-7302 to speak with me today. We office a wide range of quality custom home services for clients in Mooresville, Lake Norman, Cornelius, Davidson. Huntersville, Troutman, Sherrills Ford, Terrell, Denver, Catawba, Mount Ulla & Stony Point, North Carolina!